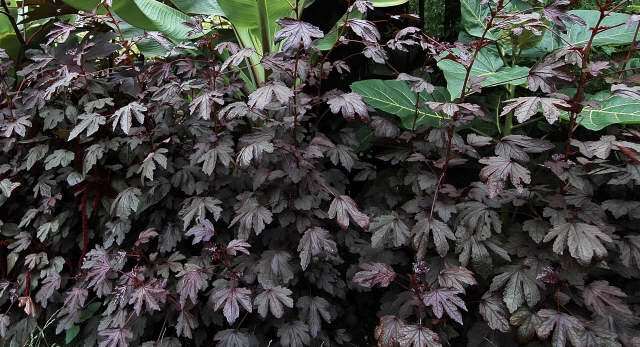 An attractive group of plants with tropical foliage and late season flowers. Some of the shorter, multi bloom varieties of sunflower can complement plants grown in a more Mediterranean setting. Squirrels are a nuisance though. Although hostas fit well into the tropical scheme initially, they fade too early in the season. They also take up a disproportionate amount of your time on slug control. Growing them in pots allows them to be removed from site when faded, and control slugs more effectively using copper tape. The main problem with this plant is that it waits just a bit too long to get going. Germinates easily but sits in the ground for most of the summer before then growing rapidly. Purple foliage.